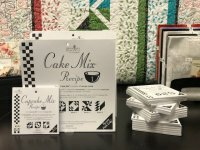 What is a Moda Cake Mix? It’s a recipe for block parts that makes baking a Layer Cake quilt easier than ever. 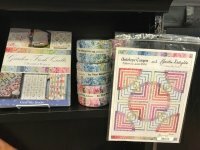 This unique triangle paper is designed to work in conjunction with Moda’s 10″ square Layer Cakes. Each tablet has 42 sheets – one for each layer in a Layer Cake – and a couple of extras for practice. 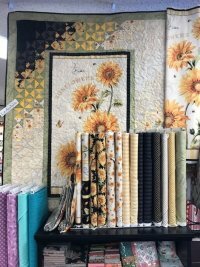 Each pad also includes a few simple block and layout ideas – just add 1 or 2 Moda Layer Cakes and you’re ready to start stitching. 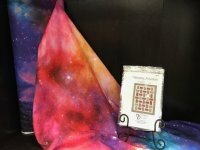 Stop by the store and check out this NEW product! Stop by the store to view this eye catching quilt using sunny fabrics from Wilmington Prints. Kit includes the pattern by Lisa Audit. 2017 "On the Go!" Row by Row Experience is almost over! Be sure to travel and collect rows before Sept. 5, 2017. See https://www.rowbyrowexperience.com/ for more information.